PamelaQuilts: Four Seasons Blog Hop - Paisley Dot, Star Shower, and a Giveaway! Four Seasons Blog Hop - Paisley Dot, Star Shower, and a Giveaway! Hi! 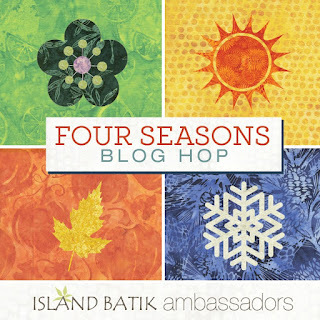 Glad you stopped by to see my post for the Four Seasons Blog Hop (brought to you by Island Batik!) This week we are celebrating summer. Today's fabric line is Paisley Dot. What a gorgeous line! The precuts come in two collections - brights and earthtones. I got the whole set to play with in a fat quarter bundle - and what fun it was! You will definitely want to keep your eye out for these - they will be arriving at your local shop soon. When I found out the theme of the blog hop, I started thinking about summer, and one of my favorite things about summer is staying up late and watching the stars, so of course I decided to make a star quilt. Variable stars make up quickly using flying geese blocks, so that's what I went for. I had a blast mixing and matching all the colors to make stars that reminded me of all the great things about summer. Sunny blue and yellow. Green grass and rainbow sherbet! Watermelon, so juicy and sweet. I could just go on and on, so many fun colors that made me think of summer - sand and water, fresh fruits and veggies, ice cream treats, swimming pools....I just can't wait for summer to get here now! Making the blocks was fast and easy. For each block I chose three fabrics - a background, center and star points. For the star points I made flying geese units. I used a 7 3/4 inch square from the background color and four 4 1/4 inch squares from the star point fabric. I used the Ultimate Flying Geese Tool by Creative Grids and it helped my flying geese to be so nice and perfect at 3 1/2 by 6 1/2 after trimming up. And added one center square cut at 6 1/2. Sew it all together and you get one star. I repeated these steps, mixing and matching different fabrics until I had 16 squares. All of this summer beauty goes perfectly surrounded with a blue deep enough to be the summer evening just as the stars come peeking out, before it gets fully dark. I had just enough of the deep blue to cut nine 12 1/2 inch setting squares, and the triangles for the outside! I cut 2 inch strips from 18 fat quarters for the scrappy binding. I loved making this cheerful quilt, and used every single color I received in my bundle - scrappy is definitely my love language for quilts! I used a darkish blue Aurifil Thread for the quilting. I feel like I use this swirly quilting a lot, but it really went so well with the fabric I decided to just go with it, even though it's not super exciting. I love the way the thread blends in with the darks and the lights. Now it's time for a giveaway! I have three Stash Builder Rolls to share with someone - due to the postage costs this prize is restricted to US residents and all three rolls go to one lucky winner. I would love to give something away to those of you who don't live in the US, so if my winner is an International entry I will send you three of my PDF patterns - so everyone can enter. Leave me a comment telling me what rotary ruler you used last - I'm curious as to what fun rulers everyone else likes! Here is the schedule for this week - make sure you visit all the blogs to see the beautiful fabrics and enter to win the giveaways. Fall starts next week, so stay tuned! That's beautiful! I love the colors in this collection. The last ruler I used was the Fiskars 6 1/2 by 24 1/2" to cut strips for my quilt, post due on Wed. I wish they still made this ruler. Not many others come with the extra 1/2" and have a good 1/4" mark along the edge. I have completely fallen in love with Quilters Select rulers. Now I just need enough money to buy more. I used the 6in last. These and the Bloc Loc HST rulers have changed my life. I love your quilt. That beautiful blue you used for the background highlights your gorgeous blocks so well. Thanks for the inspiration! The last ruler I used was a 12 inch square ruler that I love for squaring up the corners of projects. Your quilt turned out great! The last ruler I used was my 12 x 6. I like it for cutting strips which is was I was last doing. Thanks for sharing the awesome giveaway! You made a beautiful scrappy star quilt! I always use my 24" Omnigrid ruler, but the last speciality ruler I used was the Quick Curve Ruler. I mostly use basic rulers although I own a variety of specialty types. My very favorite is the one I use for trimming blocks when paper piecing and for cutting small pieces. It's 3 1/2" by 9 1/2" which might not be a common size, but I use it all the time. Your quilt is gorgeous! I love that intense blue background! The last ruler I used was my Creative Grids 7 1/2" square ruler. I use it all the time. Beautiful quilt! I like seeing all the "in progress" photos. Last ruler: Creative grids 6 1/2 x 12 1/2. Your quilt is beautiful. Anything with batiks and stars really gets my attention. The last ruler that I used is my Creative Grids 1 1/2 inch ruler. This ruler is so handy and I love that it doesn't slip. Gorgeous quilt, vibrant colors and scrappy. The last ruler I used was my Creative Grid 8 1/2" x 12 1/2", love CG rulers! Last ruler I used was one of Bonnie Hunter's to cut quarter square triangle pairs. Last ruler I used was my Omnigrid 24 x 6. I was using it to cut wallpaper! Nice quilt! I used my Omnigrid 6.5" x 6.5"
I love your scrappy star quilt Pamela! It is really beautiful. Since the weather has been so frigid, it has been too cold to go in the sewing room so I have been doing a lot of cutting. (On the kitchen table) The rulers that I was using was the 12 1/2 x 12 1/2 and the 6 1/2 x 6 1/2 Omnigrid. Thank you for the giveaway. I love your Stars quilt! That blue is beautiful! The last ruler I used was my Creative Grids 6 1/2 by 24 and a 12 1/2 square. I was trimming my quilt, getting ready to put the binding on it. Very Cheerful quilt, love the fabrics!! Not too exciting. I used my Omnigrid long ruler to prep some fabric for sewing. I used my 6 inch Quilt in a Day ruler last. Gorgeous. I love 'dots' and these fabrics literally make me salivate. I use quite a few rotary rulers - I know they say stick with the same one through-out your project. - but I'm an equal opportunity user. My tried and true is always the 6" x 24". Your quilt is beautiful and vibrant. Thank you for the chance to win. I used both my 24"x3-1/2" and 12"x6" last night. I am amazed at how frequently I use the narrow ruler. I last used my 6 x 24 ruler. yesterday i used my 6.5 inch easy square and my 6X12 inch omnigrid rulers. love these fabrics and your quilt is beautiful. My Creative Grids 6 x 12 ruler is probably the one used most when I'm sewing or quilting. It's so handy for so many things. I love scrappy too! This is a beautiful quilt and it sure shows off the lovely batiks. Hmmm. The last ruler I used was an Omnigrid 4" x 12". Sure a handy size! I don't really have any special rulers, just a normal 6x24 and 12.5x12.5 square. They suffice for what I need, though! I love your quilt! My 6 by 24 inch Omnigrid ruler is the last ruler I used, and the first one I grab when I quilt. Thanks for sharing your pretty quilt. Beautiful colors! It's such a cheery quilt ... love it! Several years ago I won a Creative Grids ruler on a blog giveaway, and I'm telling you, it's the best! I love your quilt! I'm also a lover of scrappy I guess because of the way I was taught to quilt. That was all we had was scraps! I love star quilts. Yours is great. I used both my 12.5 inch square and my 6 x 24 inch rulers last night. The only specialty ruler I've ever used is the Lil' Twister. Love your quilt, even the back - always looking for new layouts for piecing backs. Good way to use up stash. I used my 12.5 in ruller last. I think it was my combo ruler/cutter. I have been working on an applique quilt, so I haven't been piecing lately. I use my Creative Grids basic 6.5 by 24 inch ruler most but I just got a fussy cut ruler to try. Love your quilt. That is "sew" bright and cheery. Perfect for that cold winter day around here. What beautiful fabrics! I love how they look in your quilt with the deep blue. Nothing exciting - I have my basic rectangle ruler for cutting. Your quilt is beautiful! I last used my 12 1/2 inch square and 6x24 frosted Olfa rulers to trim a quilt--they are my favorites! most of the time I use my 24 inch ruler. I mostly use my six by 24 ruler. The last ruler I used is the Creative Grids Pineapple Trim Tool Mini. Your quilt is so cheery with all of those bright colors ... love it! I'm in love with all the Loc-Bloc rulers: half-square triangle, flying geese, and the pineapple ones. I use them every chance I get because they make squaring things up so much easier. I have been using my newest ruler (Simple Folded Corners Ruler)by Doug Leko, as well as the Essential Triangle Tool by Bonnie Hunter--they both work very well! Love the quilt! I like the blue you added. It balances out all the batiks. I use my 6.5" square and 6"x 24" rulers daily. I like any square ruler. What a happy quilt! The colors are set off beautifully by the stars! 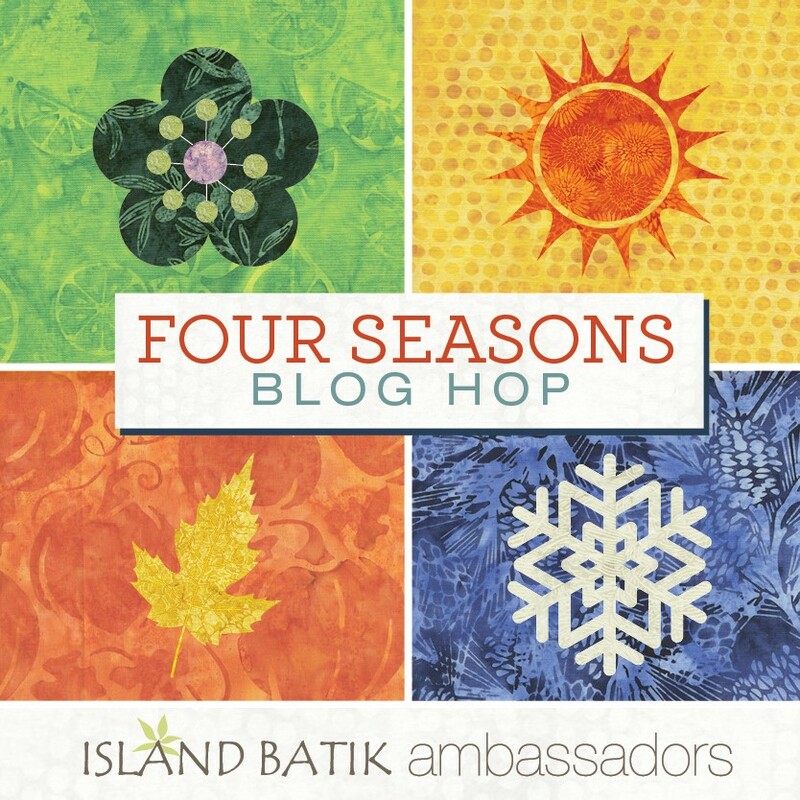 The Island Batiks are gorgeous and I would like to win those! I have been using my June Tailor Binding Buddy this morning because it is 30 inches long so very easy to use with my large mat, as I was cutting long strips of fabric. I also have been using my EZ Quilting Easy Square Jr that is 6 1/2 inches square with lots of grid markings, as I square up some blocks. Thanks for the giveaway! Lovely bright colors in your star quilt! The ruler I used last (and use the most) is my Omnigrid 6" x 12" ruler. The last ruler I used was my 6x12...it is my go-to ruler for anything less than 12"!! I use my 24 inch Omnigrid and 12.5 square all the time! Love your star quilt - Thank you for the giveaway and being in this hop! Love your quilt! Beautiful! That blue is amazing!! The last ruler I used was a 6 1/2 x 2 1/2 for some handwork. The last ruler I used was my 6 1/2" x 24" because I was trimming up a quilt for adding the borders. Your quilt is beautiful, thank you for sharing it with us. Beautiful interpretation of summer. I love to sit out and watch the stars as well. We have fireflies too! Most recent specialty ruler was the Jaybird Hex and More. So fun and so versatile. I am in the middle of doing some crumb quilting; I actually have 4 rulers I have been using. Not sure which was the exact last one, since I use all 4 in one sitting. The 4 sizes are a 12 1/2" square, a 9 1/2" square, and a 2 1/2" square all from Omnigrid and a 2 1/2 x 8" from MSQC. Love the quilt...that background blue is fabulous! Just took a class from Cheryl Lynch, creator of the Curvalicious ruler-working with Silk Dupioni! I adore your star quilt, it makes me smile and think of summer. The last ruler I used was my Omnigrid 6 1/2 square. Thanks for the chance to win. Generally I use my multi purpose 6"x24" but I've been squaring up HST and using the BlocLoc squares which I love. Thanks. The last ruler I used was my OmniGrid 6 by 24 ruler - I use it most - followed by the 12 1/2 square one. The last ruler I used is the June Taylor ruler that has lines every 1/2 inch. It is great for cutting strips of up to 12 inches. I think they have one that will go up to 18 inches too. I am paper piecing right now so my Add-an-eight and Add-a-quarter are getting a workout. The last ruler that I used was my 20 1/2" square. I had to cut a background piece that was 18"x 16"
I used my Creative Grids 8-1/2” X 24-1/2” ruler last. It’s my go to for so many tasks. PS...love all those perfect flying geese stars! Beautiful! I love stars ⭐️ ! Beautiful star quilt. The last ruler I used is my 6.5" square. I was using it to square up hst blocks. What's not to love?.....Scrappy plus stars equals another winner Pam! Love my Wing Clipper 2 ruler! I love my new Creative Grids 7-1/2 inch square. Love your quilt since I always love stars. This morning I was cutting rectangles with my Missouri Star Quilt Co. 5 x 15. I think it is a good, manageable size. Love the colors in your quilt. The last ruler I used was my 6" x 24" Omnigrip ruler. Love the scrappy design and colors of your quilt-especially the dark blue squares between the blocks. They really look so well together! The last ruler I used I think was my Creative Grids 6-1/2 x 24-1/2. I usually use a few different ones when I'm cutting fabric, but this is probably my favorite! What a beautiful star quilt...than blue is so gorgeous! I don't know the name of my ruler that I use the most, but it is a 3" wide straight edge ruler that is by my side always! I used my 15" by 15" ruler today. I'm making bags for rev war reenactors and this ruler is perfect. Your star quilt is lovely. The last rotary ruler I used was my 20 1/2" square. When I first bought this ruler my was skeptical about how often I would use it. My skepticism was unfounded as I use it regularly. I don't have many rulers but the last one I used was a 6"x24"
Last ruler I used was a Skyhawk, 6 1/2 by 24. Your stars are gorgeous !! What a beautiful quilt! The last ruler I used was a 20 1/2" square ruler. My go to ruler is my 6 x 12 inch. It’s the easiest to handle in the small space I have. Plus, I’m still way lacking in piecing but even when I mess up, I keep going because I hate to waste fabric. This year I will get better. Thanks so much for a look at your lovely quilt, it’s so colorful, just my type! What a bright and happy quilt! Great fabrics and quilting! The last ruler I used was my 24” Omni ruler. Creative Grids 6 1/2x 12 1/2.